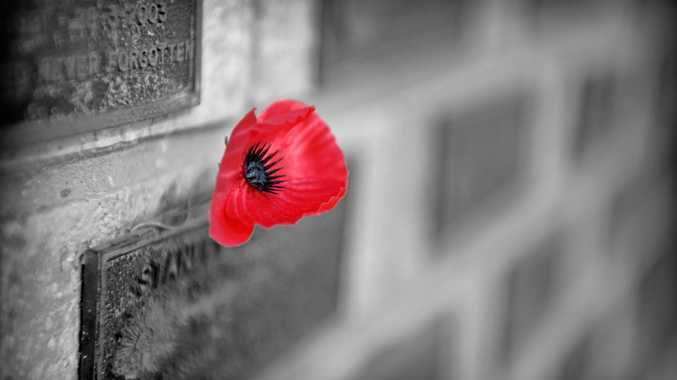 IT MAY be the start of autumn, but that doesn't mean it's going to cool down anytime soon. In fact, the latest seasonal outlook issued by the Bureau of Meteorology (BOM) predicts much of Australia will hit above-average temperatures. 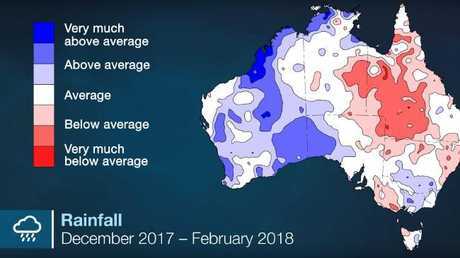 BOM senior climatologist Dr Andrew Watkins said summer was exceptionally warm and dry for much of eastern Australia, while the west was hit by record-breaking rainfall. "Broome has already had its wettest year on record, with over 1.5m of rainfall and widespread flooding," he said. Mostly cloudy. Slight (30%) chance of a shower. The chance of a thunderstorm inland late this afternoon and evening. Light winds becoming east to southeasterly 15 to 20 km/h in the middle of the day then becoming light in the late afternoon. Daytime maximum temperatures around 30. Partly cloudy. Medium (60%) chance of showers, most likely in the late morning and afternoon. The chance of a thunderstorm inland from late this morning. Light winds. Daytime maximum temperatures around 30. Capricornia Partly cloudy. Medium (60%) chance of showers, most likely in the late morning and afternoon. The chance of a thunderstorm from late this morning, most likely inland. Light winds. Daytime maximum temperatures in the low to mid 30s. Partly cloudy. Medium (60%) chance of showers. The chance of a thunderstorm from late this morning. Winds east to northeasterly 15 to 20 km/h becoming light in the morning then becoming northeasterly 15 to 20 km/h in the late evening. Daytime maximum temperatures 30 to 38. Partly cloudy. High (70%) chance of showers in the north, medium (40%) chance elsewhere, most likely in the late morning and afternoon. The chance of a thunderstorm in the north. Light winds. Daytime maximum temperatures in the low 30s. Mostly sunny. Medium (60%) chance of showers in the north, slight (30%) chance elsewhere. The chance of a thunderstorm from late this morning. Light winds. Daytime maximum temperatures 35 to 40. Partly cloudy. High (70%) chance of showers from late this morning. The chance of a thunderstorm from late this morning. Light winds. Daytime maximum temperatures in the low to mid 30s. Partly cloudy. High (80%) chance of showers, most likely during the morning and afternoon. The chance of a thunderstorm, with possible heavy falls along the coastal fringe in the north early this morning. Winds northeasterly 15 to 20 km/h becoming light in the evening. Daytime maximum temperatures around 30. Cloudy. Medium (40%) chance of showers, most likely this afternoon and evening. Light winds. Daytime maximum temperatures in the high 20s. Cloudy. Medium (40%) chance of showers. Light winds. Daytime maximum temperatures 23 to 28. Dr Watkins said there had been little rain overall in eastern Australia over summer. "Summer in the eastern two-thirds of the country was much warmer than average," he said. "The average temperature across the whole of Queensland exceeded 40C on two consecutive days in February with the state average of 40.5C on the 12th being Queensland's hottest ever February day." BOM has warned with the above-average temperatures forecast, it's not time to put away the bushfire plans just yet. Dr Watkins said the weak La Nina pattern is breaking down but there is an increased chance for a wetter than average March in parts of eastern Australia and Tasmania. "Historically, autumns following the end of weak La Nina events have been drier than average, however record-high water temperatures in the Tasman Sea may increase rainfall from any east coast lows that form later in the autumn and winter," he said. For now the BOM predicts autumn days and nights are likely to stay warm and warn heatwaves will continue to hit, particularly in areas with dry soils. 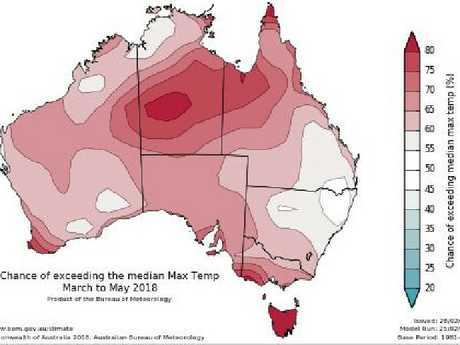 A drier than average March to May is likely for large parts of central Australia, including northern and eastern Western Australia, the southern and central Northern Territory, South Australia and western parts of the eastern mainland States. The forecast of a wetter than average March for parts of eastern Australia comes as Queensland and NSW have been battered by wild weather in recent days. The sunshine state has already copped up to 300mm of rain across the weekend in one of the worst starts to the wet season on record. Last weekend, Brisbane recorded its wettest February day in 46 years. Will unseasonably warm weather continue?